WOW! 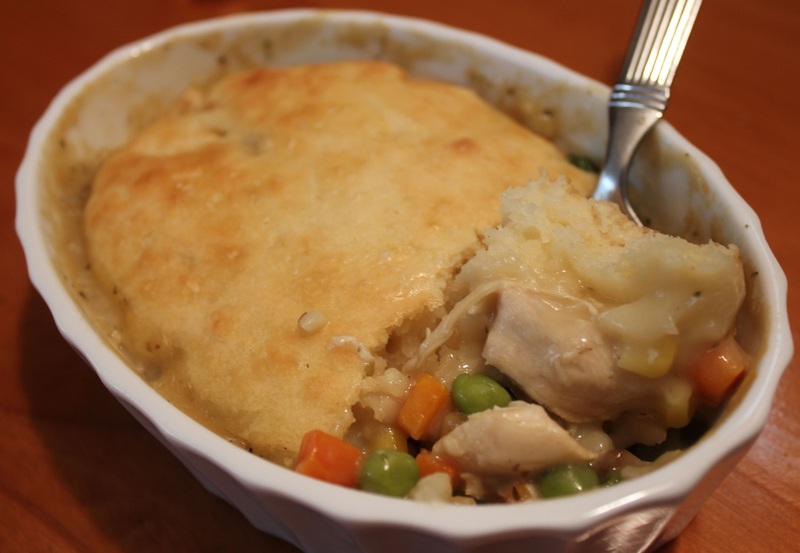 This Chicken Pot Pie is incredibly flavorful. The filling is thick and full of chicken and vegetables. Forget fussing with pastry dough the biscuit topping is not only easy to make but makes a much tastier topping than pastry does. Heat small skillet over medium heat, coat with cooking spray, place chicken in pan, sprinkle garlic powder over chicken, cover and cook for 10-15 minutes. Check chicken for doneness. When cool enough, cut chicken into 1/2 inch cubes and set aside. Heat a large skillet over medium heat, melt 1 tablespoon butter, saute onion and garlic for 2 minutes. Add the mushrooms and marjoram, sauteing for about 5 minutes more. When onions, garlic and mushrooms are tender stir in the flour until thoroughly mixed. Add the thawed vegetables and cooked chicken, stirring well. Pour 1/4 of the chicken, vegetables and sauce mixture into each of four individual casserole dishes or use a 9x9 baking dish to make one large pot pie. In a medium size bowl, mix the flour, baking powder, sugar and salt. Cut in the butter until the mixture resembles course crumbs. Make a well in the middle of the flour mixture and pour in the milk. Stir until everything is mixed well but the biscuit dough should still be lumpy. Evenly spread 1/4 of the mixture on top of the chicken mixture in the casserole dishes. Place casserole dishes on a baking tray. Bake for 20-25 minutes. Biscuit topping should be golden in color and baked through.